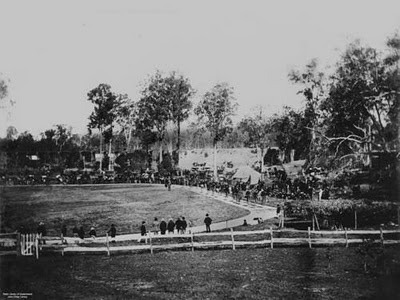 Brief interruption to story: here is a photo of a velodrome at Toowong, taken in 1885. The records show that the photo was taken outside a house in Union St, which runs off Moggil Rd just before you get to the Brisbane Boys College as you travel towards the city. Here is today's photo, taken from the same vantage point. Although still a sportsground, the cycling track has gone. Now we have an Aussie Rules football oval and cricket pitch, positioned in a lovely bush setting. An excellent green spot for the locals. I decided recently to take up cycling again in an effort to increase activity and decrease waistline. How hard could it be - you never forget, right? Wrong! Totally wrong! OK, I could remember how to mount the thing; I could manage to ride it at a snail's pace without falling off; I could stop it and dismount. But everything else was totally foreign. Where once I used to steer with subtle movements of my body, I was reduced to frantically tugging at the handlebars like a three year-old on his first trike. Turning corners involved having to avoid getting my foot caught in the spokes of the front wheel. Taking even one hand off the bars to make a hand signal prompted a wobbling, shaking, teetering movement that I was hard pressed to correct. While once I would have sneered at wearing a stack-hat whilst riding, I thought seriously about buying a motor-cycle helmet, such was the certainty that one day I would crash. Although I persisted for a while, a series of events finally led to the banishment of the bike. Those of you who need to know what happened can read it here, in an email I sent to a cycling friend. Warning: there is some very salty language - if that will offend, do not open the link. And readers - every word is true!